Pre heat the oven to 175. Grind the sunflower seeds and flaxseeds in a coffee grinder. You can grind them to a flour like consistency or leave them a little chunky. This will just effect the texture of the cracker. Mix together so that is forms a dough. Roll the dough into a ball and cover with cling wrap or a tea towel and let it sit in the fridge for 20-30 minutes. Remove the dough from the fridge and gently press or roll it out onto a lined baking tray. The dough is delicate so I often find pressing it out with your fingers better than a rolling pin. You want to dough to be a couple of centimetres thick. Make some cut marks into the dough so that once it is cooked with crackers will easily snap apart. 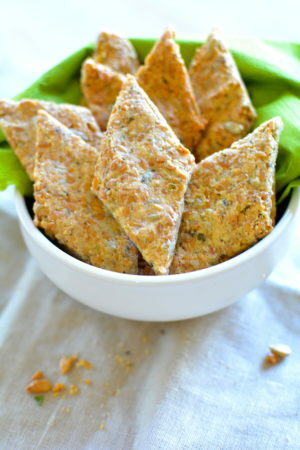 During the last 5 minutes, brush some olive oil over the crackers to help to brown them on top. Check on the crackers frequently as they can easily burn and don’t take long to cook.